The WE tv It’s On the House! Watch and Win Sweepstakes is open to individuals 18 years of age or older as of date of entry and who are legal residents of the 50 United States and the District of Columbia. Void wherever prohibited by law. Note: Weekly Entry Period 3 is a two week entry period with no new episode on Thursday, November 27, 2015. 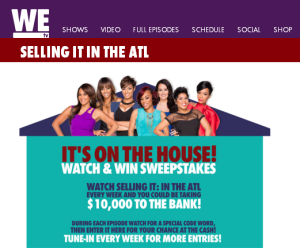 To enter watch the premiere airing of Selling It: In the ATL each week during a valid Weekly Entry Period for the Weekly Secret Code Word. (Codes will not be posted during repeats of each show.) 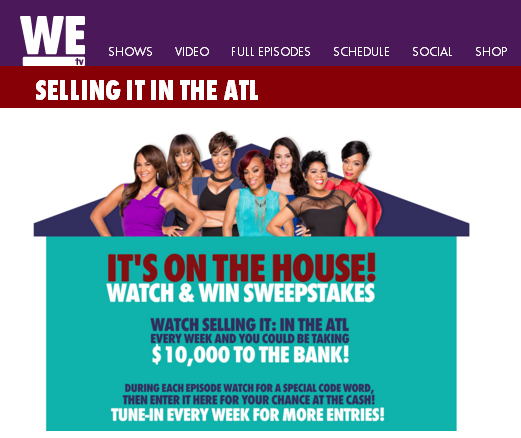 Then visit www.wetv.com to complete and submit the entry form including the Weekly Secret Code Word. Each correct Weekly Secret Code Submission results in one (1) sweepstakes entry. A new Secret Entry Code will be revealed during each of six (6) Weekly Entry Periods for a total of six (6) Secret Code Words. Limit of one entry per person per Weekly Entry Period. Entrants agree to be bound by and acknowledge compliance with these official rules including eligibility requirements. In the event of a dispute as to the identity of an entrant, the authorized account holder of the e-mail account will be deemed to be the entrant. “Authorized account holder” of an e-mail address is the natural person in whose name the e-mail address has been issued. A selected winner may be asked to provide Sponsor with proof that the selected winner is the authorized account holder of the e-mail address associated with the winning entry. If a dispute cannot be resolved, the entry will be deemed ineligible. Use of automated devices not valid for entry. Entries become the exclusive property of the Sponsor and will not be returned. One (1) Grand Prize: $10,000.00. Prize is not transferable. All taxes and other expenses not specified herein are the sole responsibility of the winners. Winner will be selected in a random drawing approximately on or about December 28, 2015 from all eligible entries received during Promotion Period. The drawing will be conducted by an independent judging organization, whose decisions are final on all matters relating to the sweepstakes. Winners will be notified by phone and/or mail and will be required to complete and return an Affidavit of Eligibility/Release of Liability which must be signed and received by Sponsor or its designated agent within 14 days of date printed on notification or an alternate winner will be selected in a random drawing. If any prize notification letter or any prize is returned as undeliverable, the prize will be awarded to an alternate winner selected in a random drawing. Odds of winning a prize depend upon the number of eligible entries received during the Promotion Period. All prizes claimed will be awarded. No more than the advertised number of prizes will be awarded. Agency will furnish an Internal Revenue Service Form 1099 to the Winner for the actual retail value of Grand Prize for the tax year in which Prize was accepted for all prizes valued at $600.00 or greater. Winner is responsible for all federal, state, and local taxes (including income and withholding taxes) and all other costs associated with Prize acceptance and use not specified herein as being provided. No transfers of prizes, in whole or in part, will be permitted, except at Sponsor’s sole discretion. This Promotion offer is void where prohibited or restricted by law and is subject to applicable federal, state, local and municipal laws and regulations. Sponsor and judges not responsible for late, lost, stolen, damaged, incorrect, incomplete, illegible, garbled, misaddressed, or misdirected entries, misrouted or scrambled transmissions or communications, for errors, omissions, interruptions, deletions, defects, or delays in operations or transmission of information, in each case whether arising by way of technical or other failures or malfunctions of telephone, Internet, computer hardware, software, communications devices, or transmission lines or data corruption, theft, destruction, unauthorized access to or alteration of entry materials, loss or otherwise. Sponsor disclaims any liability for damage to any telephone or computer system resulting from participation in, or accessing or downloading information in connection with, this Promotion, and reserve the right, at its sole discretion, to modify, cancel, terminate or suspend this Promotion should any virus, bug, technical failures, unauthorized human intervention or other causes beyond Sponsor’s control corrupt or affect the administration, security, fairness or proper conduct of the Sweepstakes. In the event of any cancellation, termination or suspension, a notice will be posted and a random drawing will be held from among all eligible entries received prior to such time. Sponsor reserves the right to terminate the Sweepstakes in the event the day and/ or time that Selling It: In the ATL airs changes or Selling It: In the ATL is canceled, therefore rendering the Sweepstakes in operable as intended by these Official Rules. In the event of any cancellation, termination or suspension, a notice will be posted and a random drawing will be held from among all eligible entries received prior to such time. Sponsor reserves the right, at its sole discretion, to disqualify any entrant if his or her fraud or misconduct affects the integrity of the Promotion. By participating in this Promotion, each entrant and Winner accept the conditions stated in these Official Rules, agrees to be bound by the decisions of the judges and warrants that s/he is eligible to participate in this Promotion. By submitting an entry in the Promotion, each entrant acknowledges and agrees that Sponsor shall be permitted to use entry data for marketing purposes consistent with their privacy policies and applicable law. All entrants further agree that in the event of any third party claims, damages, losses or injuries, arising from or relating to this Promotion, they will indemnify Sponsor and Agency from any and all such claims, including the attorneys’ fees related thereto. Entrants further release and agree to indemnify and hold harmless Sponsor, Agency and their respective officers, directors, shareholders, members, employees, representatives and agents from any and all liability, claims, actions, loss, harm, damage, injury, cost or expense whatsoever including without limitation, property damage, personal injury and/or death which may be sustained in connection with this Promotion, including, but not limited to: (a) the receipt, ownership or use or misuse of any prize awarded; (b) participation in any Promotion-related activity, including, without limitation, travel; (c) any claims based on publicity rights, defamation, invasion of privacy, copyright infringement, trademark infringement or any other intellectual property-related cause of action; (d) any typographical or other error in these Official Rules or any other materials disseminated by Sponsor; and (e) any technical malfunction, failure, error, omission, interruption, deletion, defect, delay in operation or communications line failure, regardless of cause, with any equipment, systems, networks, lines, satellites, servers, computers, or providers used by an entrant or Sponsor. ANY ATTEMPT BY AN ENTRANT TO DELIBERATELY DAMAGE ANY WEB SITE, MANIPULATE OR UNDERMINE THE LEGITIMATE OPERATIONS OF THE SWEEPSTAKES IS A VIOLATION OF CRIMINAL AND CIVIL LAWS AND SHOULD SUCH AN ATTEMPT BE MADE, THE SPONSOR RESERVES THE RIGHT TO SEEK DAMAGES FROM ANY SUCH ENTRANT TO THE FULLEST EXTENT PERMITTED BY LAW. ENTRANT AGREES THAT: (1) ANY AND ALL DISPUTES, CLAIMS AND CAUSES OF ACTION ARISING OUT OF OR CONNECTED WITH THIS PROMOTION OR ANY PRIZE AWARDED SHALL BE RESOLVED INDIVIDUALLY, WITHOUT RESORT TO ANY FORM OF CLASS ACTION AND IN ACCORDANCE WITH THE LAWS OF THE STATE OF NEW YORK WITHOUT REGARD TO PRINCIPLES OF CONFICTS OF LAW; (2) ANY AND ALL CLAIMS, JUDGMENTS AND AWARDS SHALL BE LIMITED TO ACTUAL OUT-OF-POCKET COSTS INCURRED, INCLUDING COSTS ASSOCIATED WITH ENTERING THIS PROMOTION, IF ANY, BUT IN NO EVENT WILL ENTRANT BE ENTITLED TO RECEIVE ATTORNEYS’ FEES OR BE ENTITLED TO RECOVER PUNITIVE, EXEMPLARY, INCIDENTAL OR CONSEQUENTIAL DAMAGES. For a copy of the winner’s name, send a self-addressed, stamped envelope postmarked by December 31, 2015 to: WEtv It’s on the House! Watch and Win Promotion Winners List, c/o The Promotion Pipeline, PO Box 162, Huntington Station, NY 11746 or visit www.wetv.com. Requests will be fulfilled/name will be posted, after the winners name has been verified. For a copy of the official rules, visit www.wetv.com or send a self addressed, stamped envelope to: WEtv It’s on the House! Watch and Win Promotion Rules, c/o The Promotion Pipeline, PO Box 162, Huntington Station, NY 11746. VT residents may omit return postage.